on your trailer will mean that you will no longer have to bend down and lift the coupling as far to get it onto the tow ball. A jockey wheel will also make moving an un-hitched trailer by hand much easier, and it will keep your trailer level so it can be loaded while un-hitched. Erde supply two types of jockey wheels, a lightweight version for smaller trailers and a heavy version for the commercial range. 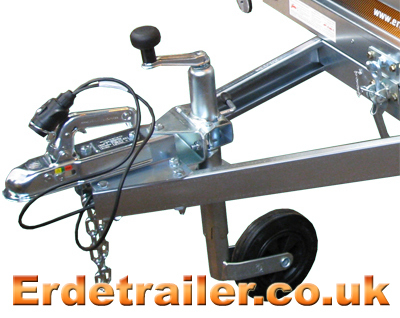 The commercial jockey wheel has a heavy duty bracket that is designed to support the weight of larger commercial trailers with A-frame draw bars. Unlike the lightweight version, this bracket mounts on the inside of the A-frame drawbar just behind the coupling. The heavy duty bracket and bigger wheel make this a much stronger alternative to the lightweight jockey wheel. For a lighter jockey wheel more suitable for Erde’s leisure range, please click here.